A great shot starts with Starline Brass the maker of America's finest straight wall brass. Starline prides itself on being the choice of top handgun shooters across all disciplines, with a production process focused on quality not quantity. Packaged in 100 count bags. En flott skudd starter med Starline messing skaperen av Americas fineste rett vegg messing. Starline stolt av å være valg av toppen pistol skyttere over alle disipliner, med en produksjonsprosess fokusert på kvalitet ikke kvantitet. Pakket i 100 count poser. To my knowledge, Starline is the only company making .500 Linebaugh brass. That is fine with me because I use Starline for any of my guns that they make brass for. I initially bought 50 rounds to use in working up a max, accurate load. Each case has been fired from three to five times using heavy charges of Lil Gun powder and a 440 gr (actual weight with gas check and lube is 461 gr) bullet. No case losses. I have just ordered 300 more. I have never had any problems with Starline brass because I believe it to be the best, regardless of caliber. Now if they would just make cases for the .222 Remington Magnum!!!! Very good brass. 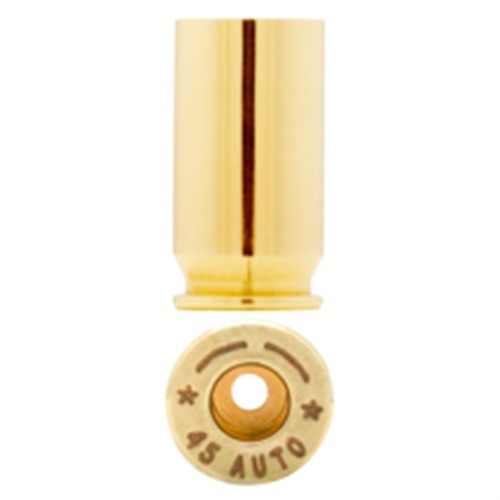 The 50AE is hard on brass, through the ejection and the pressures it creates. This brass holds up well. I'm on my 3rd reload with it and I haven't had to trim the cases as of yet. I recommend it! Starline is the ONLY manufacturers of brass for the 458 socom. That being said it is also extremely well made! Bought 2-100 round packages from Brownell's. Product appears to be high quality; a random check indicated the cases were of correct length, very uniform. However, the count was wrong in each package; 99 in one and 97 in another!! I have used this brass for a long time and never had a problem with. It will take many different load pressure and I never had one split case yet. The cases are true to form and primer pockets accept large primers. These are great cases all around! Starline makes dependable brass! I've had multiple loads in the this brass and found it to be reliable. I highly recommend the brass. I do commercial reloading, as well as reloading for my own recreational use. When buying new brass I always go for Starline as my first choice. Excellent quality and consistency, at a great price. Have never been disappointed. This is great brass. I've been shooting my 44 mag all year with it. I'm new to reloading and have gotten all of my supplies at good prices from Brownells. I'm on a tight budget so every dollar counts and I always look for the best stuff I can find for the money. I've been a shooter for 8+ years now and can say bar none Starline Brass is the best brass I've ever seen. I ordered this 44 mag brass to start loading for my Super Blackhawk Hunter. Couldn't be more pleased with the quality. I plan on picking on some 38 special when I get the chance as well. Can't go wrong with Starline. Starline brass is a very good product. I use .44 Mag for hunting and fun, and .44 special for practice and load it very light for new shooters and for "bunny whoppers" sometimes. This brass is every bit as good as anyone elses, and usually better I find. Primer pockets hold up well, which is the first thing to go on brass like this loaded warmly. Crossing fingers Brownells emails a useful discount code soon, so I will buy more! I've used Starline brass almost exclusively for all my reloading from .357 to .45Colt for at least the past 10 years. Its durability is superb and shows little to no wear around the case mouth after numerous reloads. I'm 100% sold on it! I use Starline Brass exclusively in 10mm, 41 Rem Mag, 44 Mag, 45 Colt, 454 Casull, and 460 S&W. I have loaded sized fired and reloaded Starline Brass thousands of times and never had a single problem with the brass that wasn't my own fault. They usually include one or two extras as well which is nice if you ruin one somehow. Nice Brass but I would like at least 100 pieces. I only received 99. Nice brass for a good price. I am loading the 10mm with this brass for three Tangoglio/EAA Witness semi auto pistols and an Olympic AR-15 Carbine. This brass is always perfect and the ammo functions flawlessly in all my guns. I also use Starline 380, 9mm, 40 S&W, 44 Mag, 45 Colt and 44 Magnum pistol brass. Just giving Starline & Brownells some love for this cartridge. I typically have smoother extraction with Starline vs Hornady for my 480 SRH. They do very well with the custom 440gr PXS boolit I developed. If you wait for one of Brownells great promo codes, you can really save a little change on this hard to find brass. I have used and re-used Starline 45/70 brass for two years now. I have reloaded some of them close to ten times. No trouble at all, no cracks, cap stay snug, brass seems to stay clean better than other brands, resize easy and I like the price. For MY" money , It`s Stairline Brass All the Way"
Stairline is one of the Few" , Co`s that chouse to provide Nickel" Brass , which I prefer for several reasons , # 1 it chambers And Extracts better than regular brass , and #2 , it clean`s up quicker that reg. brass and it prep`s a Lot" easyer than regular brass , and it work`s a Lot" easyer in my die`s . I have Stairline Nickel" brass in Several diff. cal`s , rifle and pistol. I Never had one bad thing to say about this brass , and some of it in my .223 rounds , I`ve loaded Over 20 time ! The nickel doesn`t flake off it like some people have said it has done , with other nickel brass. It`s TUFF Stuff . I have not seen that with Stairline Nickel Brass , nore Any other brand nickel brass , I`ve used in the past . Mine just stays nice and shinnie and it Look`s Great using it in my Stainless Steel gun`s , like my Sweet 45~70 Guide rifle . I have a LOT" of 223 Stairline Nickel brass and have reloaded That" brass the most , and the most I have to do with That brass is , trim it down a little , now and then , and then run it back through my Mini 14 rifle. It Feeds Flawlassly through That" pickie rifle . Best darn brass I`ve ever seen for that rifle . Never have" , had a problem with the primer pockets getting to lose either , and I clean those pockets out EVER" Reloading . I`m sold on the stuff . I hope Stairline Co. , Never stops making that" Nickel Brass , I tell ya that . 454 casull in a light revolver is famous for bullet creep. (bullet jumps the crimp and moves forward, locking up the cylinder.) To stop this, run the new brass thru resizer die, make sure the expander is at least .003 smaller than the bullet, and use a Lee Factory Crimp die to put a hard roll crimp on the round. This brass is great, it will take the heavy loads and the heavy crimp. I reload these with Hornady XTP bullets and Winchester primers. The primer holes did not need reamed out as I had to do for another major brand of cases. These cases do not need resized until after you shoot them. Been using this brass for quite a while now. It holds up great and is definitely well worth the price paid. If I ever wear out the bunch I have I'll be coming back for more. I'm a huge fan of Starline Brass. I use it for all my accuracy .45 ACP and 9mm loads because of its outstanding uniformity, durability, and its dense finish shines up quickly in a tumbler and looks like new, even after many reloads. And for all that, the price is right! Fast delivery, good uniform quality, just 3 of 5 100 pc. bags only had 99.
the hole bag was under the trim to length spec by at least .0010 . I have now purchased 400 cases in .380 auto they are perfect new brass. I have had only 1 case in the 400 be defective. I load these with 90g xtp with 3.5g Win 231 and they cycle every time. One note is that they all need to be chamfer prior to loading. Got this for Christmas, finally got low on brass. First time with Starline, won't be my last. Strong brass, you can put a big bell on it if you wan't or keep it tight; this brass can take it. Reloaded 100 without any problems. Feeds in multiple firearms no problem. Went to range, groups tightened up a bit. Inexpensive, quality brass that I've only loaded once, but already have more on order and plan to reload the first batch as much as I can. I recently purchased 2-100ct bags of this brass. I have puchased starline brass for other cal before and as always I am very pleased with it. That being said this recent purchase had 1 defective case and was short 1 case. 2 bad/missing cases are not a very big deal and I will continue to buy this brand. I am loading 5.0g Win 231 with 180 nosler JHP in my .40 cal. Maybe it is a Georgia thing. Just received my two bags of 100 cases. The other reviewer said he had one bad case and one missing case. My first bag was 100 cases. The second bag only contained 99 cases. QC on 40 S&W? I use this brass on reloads for PPC. It is one of the best brass in the market. Even after shot several times, it cleans well, primer seating is easy and smooth and don't show signals of wear. Har brukt mine 2 ganger i uken i 10 år. Dem er vert penngene sine og dem er lettladede. Disse anbefales avcowboy action skyttere. Ladet opp 55 grain Norma 300 grain selvstøpte kuler og har nå ladet 20 hylser tre runder før det var nødvendig med hylsetrim. Produsentnr. : 1500 En flott skudd starter med Starline messing skaperen av Americas fineste rett vegg messing. Starline stolt av å være valg av toppen pistol skyttere over alle disipliner, med en produksjonsprosess fokusert på kvalitet ikke kvantitet. Pakket i 100 count poser. Produsentnr. : 1200 En flott skudd starter med Starline messing skaperen av Americas fineste rett vegg messing. Starline stolt av å være valg av toppen pistol skyttere over alle disipliner, med en produksjonsprosess fokusert på kvalitet ikke kvantitet. Pakket i 100 count poser. Produsentnr. : 2100 En flott skudd starter med Starline messing skaperen av Americas fineste rett vegg messing. Starline stolt av å være valg av toppen pistol skyttere over alle disipliner, med en produksjonsprosess fokusert på kvalitet ikke kvantitet. Pakket i 100 count poser. Produsentnr. : 3100 En flott skudd starter med Starline messing skaperen av Americas fineste rett vegg messing. Starline stolt av å være valg av toppen pistol skyttere over alle disipliner, med en produksjonsprosess fokusert på kvalitet ikke kvantitet. Pakket i 100 count poser. Produsentnr. : 4510 En flott skudd starter med Starline messing skaperen av Americas fineste rett vegg messing. Starline stolt av å være valg av toppen pistol skyttere over alle disipliner, med en produksjonsprosess fokusert på kvalitet ikke kvantitet. Pakket i 100 count poser. Produsentnr. : 1100 En flott skudd starter med Starline messing skaperen av Americas fineste rett vegg messing. Starline stolt av å være valg av toppen pistol skyttere over alle disipliner, med en produksjonsprosess fokusert på kvalitet ikke kvantitet. Pakket i 100 count poser. Produsentnr. : 380AUTO En flott skudd starter med Starline messing skaperen av Americas fineste rett vegg messing. Starline stolt av å være valg av toppen pistol skyttere over alle disipliner, med en produksjonsprosess fokusert på kvalitet ikke kvantitet. Pakket i 100 count poser. Produsentnr. : 1300 En flott skudd starter med Starline messing skaperen av Americas fineste rett vegg messing. Starline stolt av å være valg av toppen pistol skyttere over alle disipliner, med en produksjonsprosess fokusert på kvalitet ikke kvantitet. Pakket i 100 count poser. Produsentnr. : 38SUPER En flott skudd starter med Starline messing skaperen av Americas fineste rett vegg messing. Starline stolt av å være valg av toppen pistol skyttere over alle disipliner, med en produksjonsprosess fokusert på kvalitet ikke kvantitet. Pakket i 100 count poser. Produsentnr. : 1700 En flott skudd starter med Starline messing skaperen av Americas fineste rett vegg messing. Starline stolt av å være valg av toppen pistol skyttere over alle disipliner, med en produksjonsprosess fokusert på kvalitet ikke kvantitet. Pakket i 100 count poser. Produsentnr. : 454CASULL En flott skudd starter med Starline messing skaperen av Americas fineste rett vegg messing. Starline stolt av å være valg av toppen pistol skyttere over alle disipliner, med en produksjonsprosess fokusert på kvalitet ikke kvantitet. Pakket i 100 count poser. Produsentnr. : 4570 En flott skudd starter med Starline messing skaperen av Americas fineste rett vegg messing. Starline stolt av å være valg av toppen pistol skyttere over alle disipliner, med en produksjonsprosess fokusert på kvalitet ikke kvantitet. Pakket i 100 count poser. Produsentnr. : 480RUGER En flott skudd starter med Starline messing skaperen av Americas fineste rett vegg messing. Starline stolt av å være valg av toppen pistol skyttere over alle disipliner, med en produksjonsprosess fokusert på kvalitet ikke kvantitet. Pakket i 100 count poser. Produsentnr. : 1900 En flott skudd starter med Starline messing skaperen av Americas fineste rett vegg messing. Starline stolt av å være valg av toppen pistol skyttere over alle disipliner, med en produksjonsprosess fokusert på kvalitet ikke kvantitet. Pakket i 100 count poser. Produsentnr. : 1800 En flott skudd starter med Starline messing skaperen av Americas fineste rett vegg messing. Starline stolt av å være valg av toppen pistol skyttere over alle disipliner, med en produksjonsprosess fokusert på kvalitet ikke kvantitet. Pakket i 100 count poser. Produsentnr. : 1400 En flott skudd starter med Starline messing skaperen av Americas fineste rett vegg messing. Starline stolt av å være valg av toppen pistol skyttere over alle disipliner, med en produksjonsprosess fokusert på kvalitet ikke kvantitet. Pakket i 100 count poser. Produsentnr. : 1600 En flott skudd starter med Starline messing skaperen av Americas fineste rett vegg messing. Starline stolt av å være valg av toppen pistol skyttere over alle disipliner, med en produksjonsprosess fokusert på kvalitet ikke kvantitet. Pakket i 100 count poser. Produsentnr. : 3840BRASS En flott skudd starter med Starline messing skaperen av Americas fineste rett vegg messing. Starline stolt av å være valg av toppen pistol skyttere over alle disipliner, med en produksjonsprosess fokusert på kvalitet ikke kvantitet. Pakket i 100 count poser. Produsentnr. : 3855BRASS En flott skudd starter med Starline messing skaperen av Americas fineste rett vegg messing. Starline stolt av å være valg av toppen pistol skyttere over alle disipliner, med en produksjonsprosess fokusert på kvalitet ikke kvantitet. Pakket i 100 count poser. Produsentnr. : 4065BRASS En flott skudd starter med Starline messing skaperen av Americas fineste rett vegg messing. Starline stolt av å være valg av toppen pistol skyttere over alle disipliner, med en produksjonsprosess fokusert på kvalitet ikke kvantitet. Pakket i 100 count poser. Produsentnr. : 3700 En flott skudd starter med Starline messing skaperen av Americas fineste rett vegg messing. Starline stolt av å være valg av toppen pistol skyttere over alle disipliner, med en produksjonsprosess fokusert på kvalitet ikke kvantitet. Pakket i 100 count poser. Produsentnr. : 4052 En flott skudd starter med Starline messing skaperen av Americas fineste rett vegg messing. Starline stolt av å være valg av toppen pistol skyttere over alle disipliner, med en produksjonsprosess fokusert på kvalitet ikke kvantitet. Pakket i 100 count poser. Produsentnr. : 475LINEBAUGH En flott skudd starter med Starline messing skaperen av Americas fineste rett vegg messing. Starline stolt av å være valg av toppen pistol skyttere over alle disipliner, med en produksjonsprosess fokusert på kvalitet ikke kvantitet. Pakket i 100 count poser. Produsentnr. : 50AEBRASS En flott skudd starter med Starline messing skaperen av Americas fineste rett vegg messing. Starline stolt av å være valg av toppen pistol skyttere over alle disipliner, med en produksjonsprosess fokusert på kvalitet ikke kvantitet. Pakket i 100 count poser. Produsentnr. : 4550 En flott skudd starter med Starline messing skaperen av Americas fineste rett vegg messing. Starline stolt av å være valg av toppen pistol skyttere over alle disipliner, med en produksjonsprosess fokusert på kvalitet ikke kvantitet. Pakket i 100 count poser.